Last week, researchers at Slice Intelligence claimed that Apple had taken orders for as many as 957,000 Apple Watches in the first 24 hours that it was available on Apple.com. And that was in the U.S. alone. Now Slice is back, with new numbers suggesting that demand for the Apple Watch is far, far exceeding supply. According to Slice, in fact, Apple may have sold as many as 1.7 million Apple Watches since pre-orders began. And if your Apple Watch still hasn’t shipped, you’re not alone: 78% of all Apple Watch buyers are in the same boat. According to Slice’s latest data, only 376,000, or about 22%, of all Apple Watch preorders shipped to customers during the initial launch weekend from Friday to Sunday. Slice analyzed about 2 million shoppers’ email receipts, then extrapolated based on 10,744 transactions that around 1.7 million Apple Watches have been pre-ordered so far. Unfortunately, when it comes to Apple Watch delivery, the numbers aren’t quite so good. According to Slice, only 376,000 Apple Watches have been shipped so far, just a third of what was ordered on the first day of sales. When will the rest ship out? 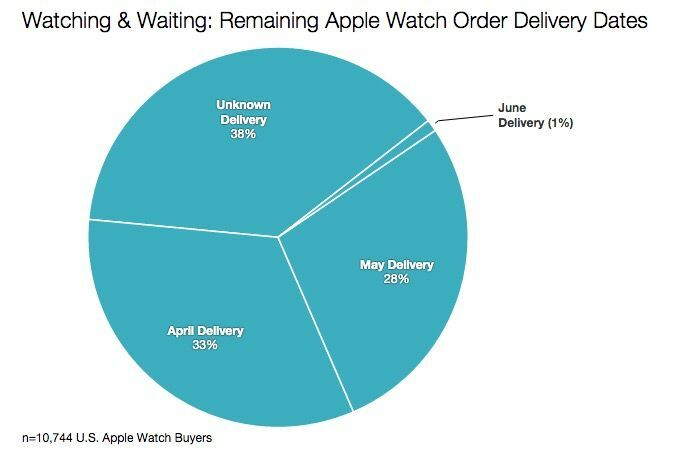 A remaining 547,000 watches are expected to ship between April 27 and June 11; and 639,000 people after that have an “unknown delivery date,” based on demand. The bottom line? Even if you ordered an Apple Watch already, you may have a long while to wait. And if you didn’t? You might not get one until July or later.